It is our great honor to announce that now you can have a cool Sothink Logo Maker Pro! The brand new Sothink Logo Maker Pro is officially released! It is an awesome graphic design and logo design program for all fields. What is Sothink Logo Maker Pro? Sothink Logo Maker Pro is an ideal graphic design software for web design and commercial print. 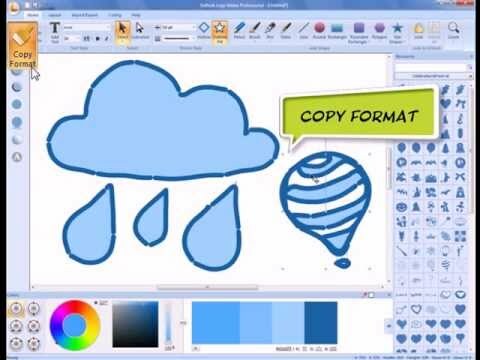 It is capable of creating vector artworks and nice-looking logos with its smart drawing tools, advanced color schemes and special effects. The new features you canâ€™t miss in Pro. Expert drawing toolsâ€”one of the most exciting new features in Pro is that it adds hand-drawing tools. These tools include pencil, pen, brush, line, rectangle, round, rounded rectangle, polygon, star shapes etc. So you can start design by drawing on blank canvas directly and customize your shape to make the logo unique and distinct. Please be noted that you have another choice of graphic drawing except for Photoshop and CorelDraw. Natural optical color wheelâ€”it is another outstanding features of Pro. It presets a color wheel to provide professional color combination for your reference. You choose one dominant color in the color wheel; the software will list all combinations of four colors. You can choose the best color solution for your project. Rich logo effectsâ€”Logo Maker Pro provides rich effects in the panel. You can apply effect to any element and preview different effect as you move mouse over its icon. Meanwhile, you can also convert text into shape. It makes you combine scattered letters of text as any way you like. Whatâ€™s the difference between Logo Maker and Logo Maker Pro? Although the name is similar, thereâ€™s huge difference in functions. As a matter of fact, Logo Maker Pro is far more advances. Check the difference by logo design comparison. Logo Maker Pro is a must-have logo design and graphic design software for all designers. It meets any requirement of you design project with its functional graphic editing ability, professional color solutions and rich effects and templates. You are welcome to downloadÂ logo design software ProÂ (30-day free trial). More info about logo design software Pro. This entry was posted in Compay Events, Sothink Logo Maker Pro and tagged graphic and logo design software, logo design software, logo design tool, logo maker software, logo maker tool by benny. Bookmark the permalink. I love writing, I love writing articles that are useful and helpful to users. I write the original!